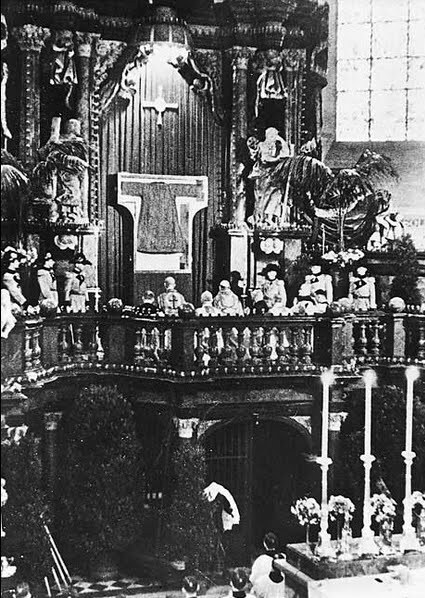 In the year 1512 Emperor Maximilian I demanded to see the greatest relic of Trier Cathedral, which had heretofore been enclosed invisbly in the cathedral's high altar: the Holy Coat, the seamless garment (tunica inconsultilis) of Christ, which according to tradition, Empress St. Helena had sent there. 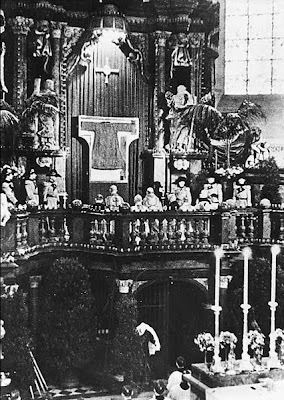 Upon his insistence, the high altar was opened and the Holy Coat shown to the Emperor, and after the people had heard of this and demanded to see it, too, the first solemn public showing took place. Afterwards, pilgrimages took place at first yearly, then - in consonance with the Aachen pilgrimage - every seven years. However, after 1545, due to the warlike times that followed, the pilgrimages only occurred at irrgeular intervals, with a 150 year gap between 1655 and 1810. The pilgrimages of 1891, 1933 and 1959 drew each around two million pilgrims, while the last pilgrimage of 1996 still attracted almost one million. To mark the quincentenary of the first public exposition in 1512, this year will see the next Holy Coat Pilgrimage. It will take place from 13 April to 13 May. Pope Benedict has appointed Card. Ouellet, the Prefect of the Congregation for Bishops, as his Special Envoy for the solemn opening on the Friday in the Ocatve of Easter. Among the six daily Masses offered during the pilgrimage and listed on the official website, one is in the Extraordinary Form. 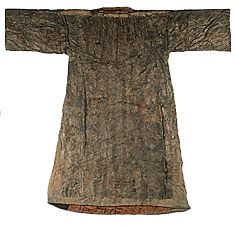 Image of the Holy Coat taken from the website of the diocese of Trier. 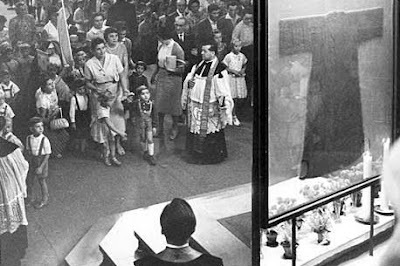 Images of earlier expositions taken from the official website of the 2012 pilgrimage.